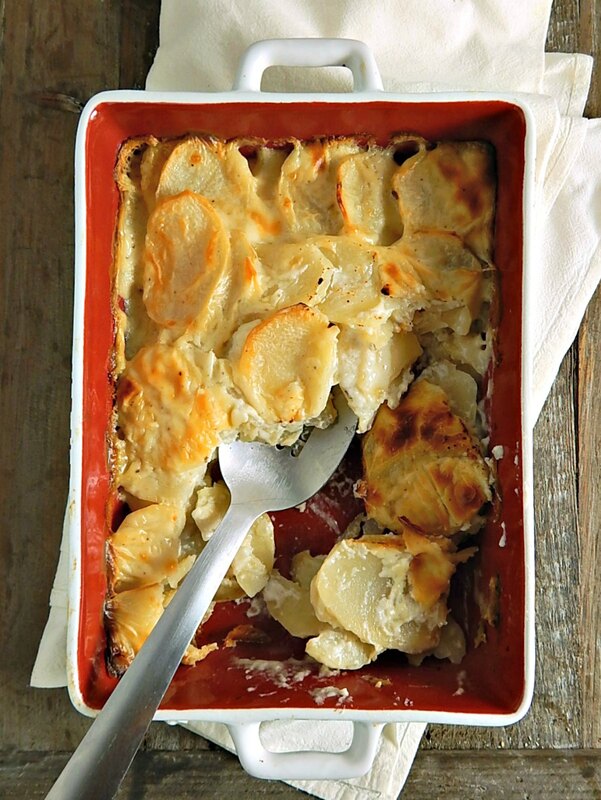 Scalloped Potatoes, like the ones your Grandma made! If there ever was a universal comfort, at least in the Midwest and maybe even the rest of the country, it has got to be Scalloped Potatoes. Rich and creamy, bubbly and hot golden brown deliciousness, pulled right from the oven and placed at the table! I mean c’mon! This is the recipe for Scalloped Potatoes, like the ones your Grandma made. Or at least, this is how my Grandmother made scalloped potatoes, and my Mother, and since I’m a Grandmother, too, this recipe has served our family well. This recipe is recipe came straight from the 1950’s edition of the Betty Crocker Cookbook. These are the same potatoes I had growing up, served at many, many functions from family get-togethers to church dinners to funeral luncheons. Scalloped potatoes are more than a side or a meal at our house, they’re a tradition. You might notice in the photos, I cooked up Scalloped Potatoes, the original way, as a side dish. It can go so well as a side for so many meals. But at our house, the words Scalloped Potatoes are always followed by the words “and ham.” That makes simple scalloped potatoes more than a side; all of a sudden it’s a meal. A little sweet, salty ham just marries with those potatoes so well. It’s just about magical. Scalloped Potatoes and Ham is our go-to recipe whenever we have a little leftover ham from any holiday. If you’d like to see what else we do with our holiday hams, see my “Twelve Days of Ham” which started out, originally with 12 recipes for leftover ham but has grown and grown over the years. And while I love tradition, there’s a little innovation that I’m pretty sure Grandma never had. Cheese. See, back in Grandma’s day, cheese wasn’t either on or in or maybe both on and in everything. But I think Grandma would have loved Scalloped Potatoes with cheese and my kids sure did, whether the potatoes were served as a side or served as Scalloped Potatoes and Ham. The cheese can be added between the layers of potatoes as the dish is assembled or tossed into the white sauce or both. Yes to both, please, lol! You can use cheddar, which is wonderful or maybe you’d like to experiment with something else? A little Parmesan or Gruyere, maybe Fontina another fave? Maybe a mix of cheeses. The most important thing about making Scalloped Potatoes is to make sure the white sauce is done just right. I do have a whole post on White Sauces And What To Do With Them and it does have troubleshooting tips if you’d like to take a peek. Make sure to cook that flour well or the taste of raw flour will spoil the whole dish. Melt the butter, let the foam dissipate and before it begins to brown, add the flour. And stir, preferably with a whisk until the flour starts to look dryer and loses that floury taste; a minute or two usually does it. You can actually take a small pinch and give it a taste if you’re in doubt. If the flour’s too raw, you’ll know it, believe me. After the raw taste is gone, it still won’t taste good (yet) but it will not be awful like it is when the flour is raw. Then it’s time to add the milk, a bit at a time, whisking like mad until it smooths out before adding each new addition. Be careful if you’re adding the cheese to the sauce – take the sauce off the heat, then add the cheese in small handfuls, stirring after each until it has dissolved in. Buy your potatoes in larger bags, pick out the smaller, misshaped potatoes for mashing or for recipes like this where size doesn’t really matter and save the more regular sized ones for baked. Store in a loosely closed paper bag away from onions. Onions keep well, so try to buy on sale. Aldi is a good place to find reasonably priced onions. If you’ve bought too many onions to use, don’t let them go bad. Slice or dice them, saute and portion into Ziplocs labeled “onions” and freeze. You’ve just saved yourself a step for next time you make a dish. If you use half an onion, consider if you can sauté the rest and put it in a Ziploc in the freezer. If not store in the door where you’ll see it when you’re cooking next. Milk is about $2.50 a gallon in my area on sale, the cost for this recipe runs about 18 cents. Buy on sale – unopened it keeps a week to 10 days past it’s “sell by” date – then you can pick up one for the beginning of the week, and another at the end of the week for the week following. Be careful with your milk, and even opened it will last a lot longer – pour, lid and put away, don’t bring it to the table or leave it on the counter while you eat dinner or down your cereal and you’ll notice it stay fresh last MUCH longer. Butter can seem like a bit of a splurge, cost and calorie wise – but for taste and health, I’d rather use real butter than trans fat laden margarine or oils. Yes – they do have trans fat, even if the label says they don’t. Buy on deep specials, often around the holidays with store coupons or pick up at Aldi or your buyers club and freeze; it will stay fresh for months. This is the classic 1950’s Scalloped Potatoes. If desired, add a cup or so of chopped ham and/or cheese between the layers and/or a cup of shredded cheese to the sauce. Make the white sauce, first, so it’s ready when the potatoes are cut. The potatoes will oxidize if left and the dish can be too watery if they’re soaked in water. For the sauce: In medium saucepan, melt butter. Stir in flour and cook one to two minutes. Pour in milk, whisking nearly constantly until thickened. Use the spoon test: when a spoon is dipped in the sauce, turn it over, rounded side up. Run a finger from the handle to the edge of the spoon. If it leaves a track that doesn’t fill in, the sauce has thickened properly. Turn off heat and add salt and pepper, and cheese if using. Butter a 2 qt casserole dish. Pare potatoes and slice thinly. Layer potatoes in casserole with onion, and salt and pepper; add another layer of potatoes, sprinkle on the onion, salt and pepper, then top with a layer of potatoes. It’s nice to save enough nicely cut potatoes for the top layer, using the odder cuts in the bottoms layers where they won’t show. When you get to the top layer, arrange the potatoes neatly, starting around the edge of the dish and slightly over lapping, ending up in the center for a gorgeous presentation. Pour sauce slowly over potatoes – take a knife and nudge the layers a bit, so the sauce seeps down throughout. Bake, uncovered for one hour to one hour and 20 minutes, until soft and tender all the way through when tested with a knife and lightly browned on top. Let stand several minutes before serving. Makes 6 one cup servings, or 12 smaller 1/2 cup servings. If adding ham or cheese, sprinkle between the layers at the same time as the onion. Don’t add ham or cheese to the top layer, unless you wish to add a little cheese in the last five minutes or so of baking. The recipe can be halved if you’re looking for something more comparable to the size of a box of scalloped potatoes, just bake for about 30 – 40 minutes. A pinch of nutmeg in the sauce gives this “a what is that?” flavor that’s wonderful. White pepper is always a good substitution for black in bechamel sauces. A sprinkle of chives or finely sliced green onion between the layers gives a bit of freshness. This entry was posted in Click here for Bargain Meals, Click here for Fabulous Food Posts and tagged Bargain Meal of the Week, Casserole, Cheese, Family Recipe, Grandma's Recipe, Ham, hearty sides, Heritage Recipe, leftover ham, Leftovers, milk, planned leftovers, Potatoes, White sauce. Bookmark the permalink. Hi Peggy, I used to make them that way, too. I made them once for my Mom b/4 she passed away and she wasn’t happy with my deviated recipe! She grew up on this one. But I might have it written down in my box. We’re heavy into some home projects before we get hit with 16 to 24 inches of snow on Thursday, so I hardly have a minute and am exhausted, although I’m doing more directing than work, but I can do some digging around and see if I can find that recipe over the weekend. I might have it written down and I might have it in one of my cookbooks. Sorry I can’t look right away. I loved that because it was easy and it was buttery deliciousness! I’m actually starting to remember it more, now, gosh it’s been about 20 years since I made them, but I think the casserole has to be well greased, the first layer goes down, then it’s dotted with little pieces of butter, I think about a tablespoon per layer then if I remember right, it was about a tablespoon of flour over each layer, too. I remember you can’t use too much flour or it tastes floury but if memory serves it’s about equal amounts of butter and flour. And a little salt and pepper on each layer. I can’t tell you how many potatoes for sure, about two to two and a half pounds sounds about right and then you dot the top with butter but no flour. Then pour in milk slowly until you can just see it start to peek between the layers of potatoes, then cover tightly and bake about the same amount of time as this recipe, till it’s tender when pierced with a knife, then uncover for the last few minutes. I think I usually cheat a bit and turn on the broiler to brown the top up a little. That’s optional. I hope that helps – does it sound about right to you? In the meantime, when I get a chance, I’ll look around and see what I can find! Peggy, I just keep on remembering more! I think you use about a tablespoon and a half of butter and flour if you are making a smaller like 8×8 casserole but double that for a larger ones and I usually take very thinly sliced onions (cut a small onion in half and then slice wafer thin) and strew them across each layer except for the top. They just kind of dissolve away to nothing but give a little more flavor. Ok, done, now and back to yard work!! Hope that helps! lol! So true, though! 🙂 I’d gladly hand it over, or some of it at least! These came out perfect! Delicious and my son (who does no like potatoes) got a thumbs up! Hi Yolanda! Thanks for stopping by and letting me know! How fun that we have a new convert, lol! 🙂 Happy New Year to you! Hi Frugal. Love the way you conserve. I still have sliced ham (fr. the holidays in the freezer). I’ll certainly try this dish in the near future. Talking about freezer, I just used up some cooked Irish potatoes to thicken a chicken soup. I have never stored onions that way…..nice to know. Thanks for the tip bits. It has to be my number one comfort food, this dish! Not the healthiest but so good. It hurts me to think as a child I ate some form of scalloped potatoes and baked beans at some form of social gathering almost monthly, and then some at home too. This is where we are going, budgets blown on ridiculous items (Premade pancake batter) and nothing tastes good. (I’d kill for some sausage with sage and pepper) thank you for this recipe. I am a Sunday cooking father, (My wife is a wonderful cook) This one my children and I made. It already smells good, and hasn’t even cooked yet. With ham and added some cheese to the sauce. All from kitchen staples and left overs too. I hope you’ll keep reading and commenting & I’m always looking for great ideas for frugal meals!